When you need a cooling reprieve on a sizzling afternoon, there are plenty of refreshing drinks out there. 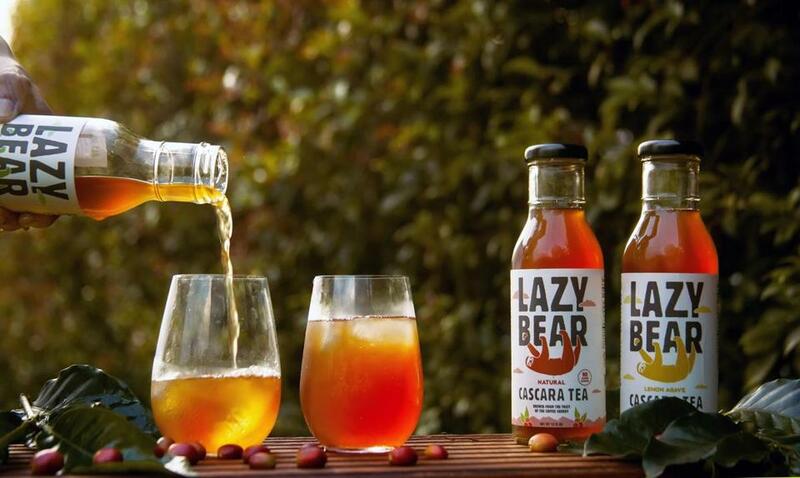 But there’s a unique one to lately hit the shelves — Lazy Bear Tea, a healthy beverage brewed with cascara (which means husk or peel in Spanish), the leftover coffee cherries, sun-dried once the beans are removed. The company sources the cascara from a small family farm in Nicaragua. The coffee-based tea tastes little like coffee, but more like a light black tea with a copper hue and pleasant sweetness. The line includes three choices — natural, flavored with lemon and agave, or mint. A 12-ounce bottle ($3.50 to $4.99) has 55 milligrams of caffeine, about the same amount as a cup of coffee. Cambridge resident and cofounder Daniela Uribe came up with the idea to create the beverages and partnered with Drew Fink and Erik Ornitz, both Harvard Business School students, who were able to get some funding from one of the school’s entrepreneurship programs. Uribe was raised in a coffee-growing family in Colombia and was well aware of the sizable piles of discarded bright red coffee cherries accumulated on coffee farms after brewers removed the beans. Sometimes the material was turned into fertilizer but mostly it was dumped into rivers. “I was most excited about the opportunity there to reduce waste in farms, which would have both an environmental and social impact,” says Uribe, who first started experimenting at home with brewing teas from the dried coffee cherries. Now, the trio receives burlap bags filled with cascara and produces the beverages at CommonWealth Kitchen, the shared space in Dorchester. Not only is the company buying what was really just waste, says Ornitz, it is also providing a new source of income for the farmers. Available at Formaggio Kitchen South End, 268 Shawmut Ave., Boston, 617-350-6996; Kurkman’s Market, 227 Cypress St., Brookline, 617-277-6500; Savenor’s Market, 92 Kirkland St, Cambridge, 617-576-6328; Pemberton Farms Marketplace, 2225 Mass. Ave, Cambridge, 617-491-2244; Volante Farms, 292 Forest St, Needham, 781-444-2351; Debra’s Natural Gourmet, 98 Comm. Ave., Concord, 978-371-7573. www.lazybeartea.com.